I am 12+ year experience SEO & Digital Marketing Expert. 100% Refund Policy if you are not satisfied with the results. Rank on first page on Search engines, Our SEO service package starts at Rs.2000 per month, Call +91 9845319526 (India) , +1 646-741-6470 New York City. We Reduce Your Ads Cost Upto 75%* + Daily Management + SEO Service, Take a Trial & See Yourself, PAY $0.00 FEES, IF YOU DON’T SEE BEST RESULTS EVER. 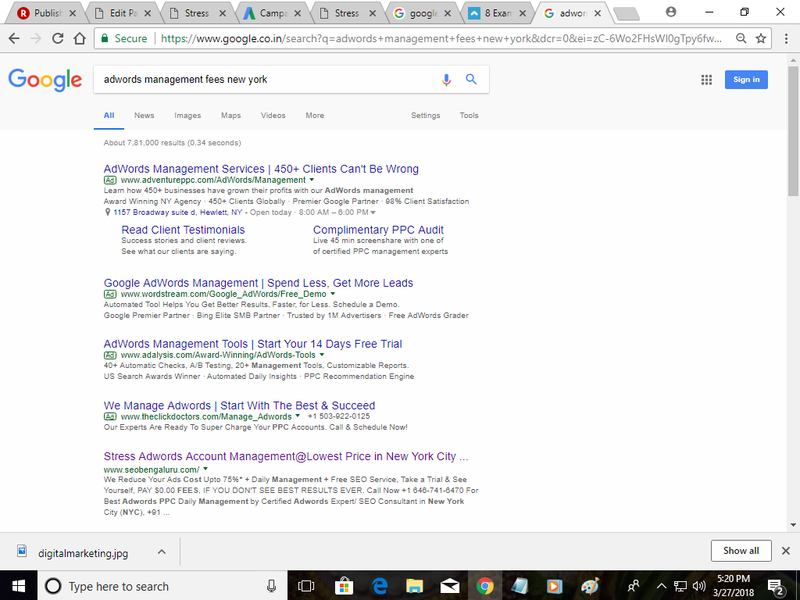 Call Now +91 9845319526, +1 646-741-6470 For Best Adwords PPC Daily Management by Certified Adwords Expert/ SEO Consultant in New York City (NYC). Stop Losing 1000’s of Dollars on Inefficient Campaigns managed by Incompetent People.Call Now +91 9845319526 India +1 646-741-6470 New York City & See the Difference, I have Turned Loss Making Campaigns into Profit Making Campaigns Within Few Days, 100% No Risk only Pay on Performance. How we help you with SEO + Digital Marketing + Google Adwords Management? We will Increase your SEO/Digital Marketing/Adwords/PPC efficiency by upto 75%* of the campaign & manage your accounts so you can focus on your business and leave online marketing to us. Our SEO/Advertisement model is based on Returns on Investments & Lowest Possible Fees by Certified Adwords Expert/ SEO Consultant Bangalore/New York City. What about Organic Search Engine Optimization vs Digital Marketing/Google Adwords? It can take some time for you to see result in Organic Seo but with Digital Marketing/ Adwords you can get clients instantly. Further trying Seo one needs to be Patient, Rushing & Unethical Seo can get u penalized, So one may go for Seo if you can wait to get business but for instant client requirement Google adwords +SEO is recommended, Of course we need to do smart management too@Lowest possible fees by Certified Adwords Expert/ SEO Consultant Bangalore/New York City. Why SEO + Google Adwords/Facebook/Bing/Yahoo Advertisements? Its is Estimated that millions of people buy online or use to search online than buy stuff offline So if you are not online you are losing a big business opportunity. I can confirm you that SEO + Digital Marketing with expert PPC campaign management gives you highest ROI compare to any Offline or Online Advertisement. This is purely on my own experience since 2005.